You can basically put anything on a nice piece of flat bread and it will be delicious. Pick combination’s that you enjoy and you’ll never be disappointed. Here’s a good one to try. 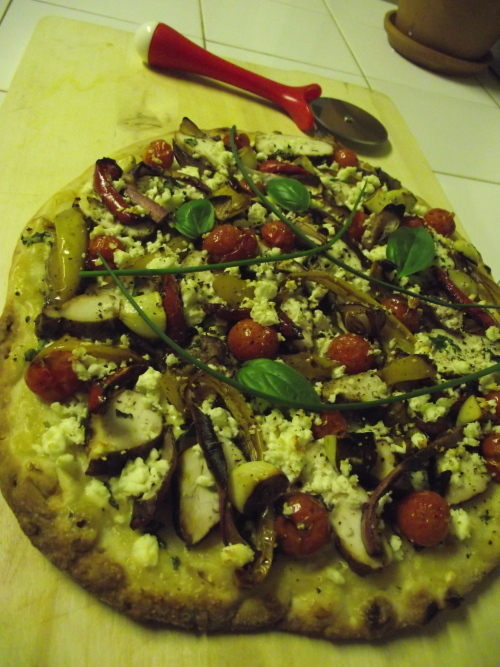 I went with the staples of onions, peppers, garlic and tomatoes and topped it with Feta. In a large bowl, mix balsamic and oil, salt and pepper and toss sliced peppers, onion, garlic and tomatoes. Thinly coat flat bread in tomato sauce. Top with roasted veg and feta cheese. Bake at 350 for 12 minutes. ** Chicken is also an excellent addition if you wish to skip the vegetarianism.